Mold can be present even in a dry climate like Colorado’s. Mold needs moisture, so water intrusion, elevated indoor humidity, faulty construction, and leaky plumbing can cause conditions favorable to indoor fungal growth. 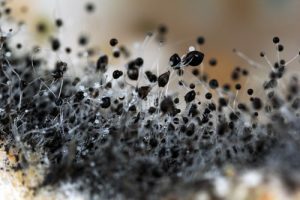 If not properly mitigated, fungi can impact the indoor air quality and, in some severe cases (such as dry rot), even weaken the structural integrity of a building. If you have observed visible mold growth or suspect that mold may be impacting your air quality, QUEST would be pleased to conduct a visual inspection to investigate potential sources of moisture and mold, monitor for trace gases, and conduct a moisture meter survey to detect any wet building materials. As requested, we may collect bulk, swab, or air samples for fungi/mold. If mitigation is recommended, QUEST provides a detailed protocol for mitigation and cleaning activities. Once cleaning has been completed, QUEST can conduct a final clearance assessment to determine the adequacy of the mitigation activities. Our contaminant assessment and management services include the cost-effective identification, quantification, and solutions design work necessary to resolve water intrusion and mold problems.